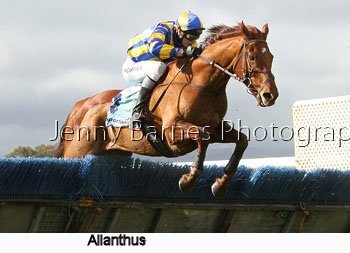 The Leslie Short Hurdle started the days proceedings with the race run on the inner Morphettville Parks track. 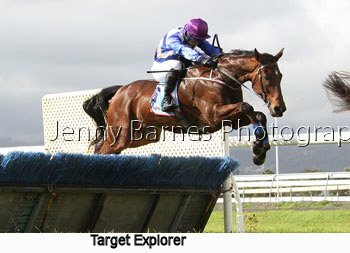 Target Explorer went to the early lead from Viking Tiger with Honour the Force next followed by Dubai Vengeance ahead of Sparkling Victory and King Triton with Allanthus with Best of Minx next with Seed Capital at the rear. 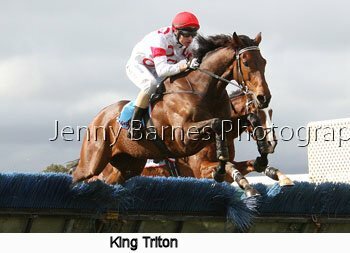 Over the third Sparkling Victory lost ground as Target Explorer went to a clear lead from Viking Tiger with Dubai Vengeance followed by King Triton as Best of Minx made a forward move out wide. 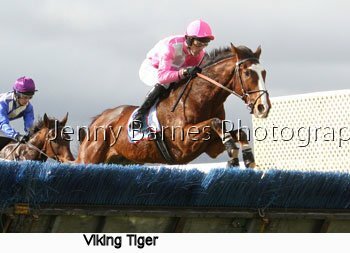 Over the two jumps in the home straight on the first lap Viking Tiger went to a clear lead from Target Explorer with Dubai Vengeance and King Triton next from Honour the Force. 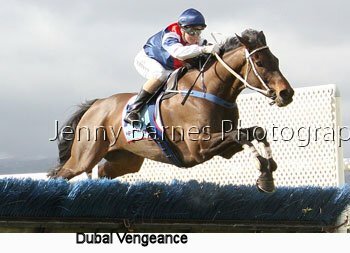 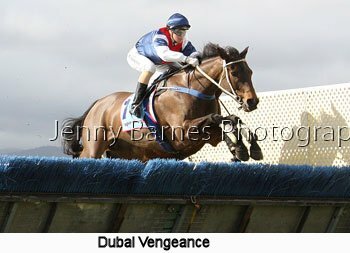 Little changed until they passed the 1400m where Viking Tiger led Target Explorer with King Triton moving up to third from Dubai Vengeance then Allanthus and Honour the Force. 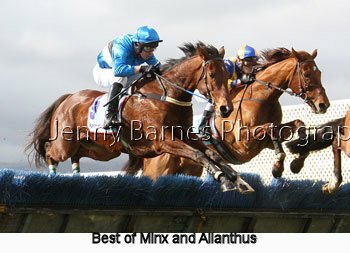 Over the jump near the 800m Viking Tiger led as King Triton moved up to a clear second with Allanthus going through on the inside of Target Explorer in join third from Honour the Force. 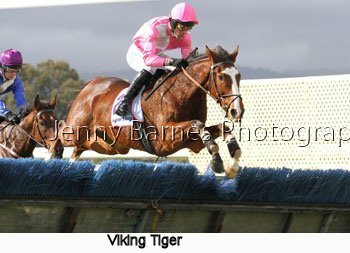 Around the home turn Viking Tiger led but King Triton was in pursuit from Allanthus then a gap to Honour the Force and Dubai Vengeance. 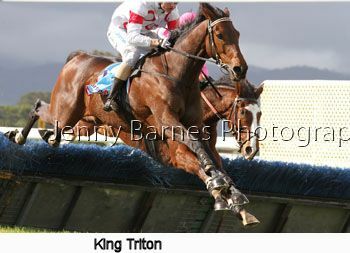 Over the last fence King Triton took control and raced away to win his second race in a row from Viking Tiger who put on a dashing display in front for the last lap with Allanthus third with the Victorian's recording what has become a rare trifecta in a local jumps race while Honour the Force (who despite being a Victorian has campaigned exclusively over the jumps in SA this jumps season) just held out SA runner Dubai Vengeance for fourth. 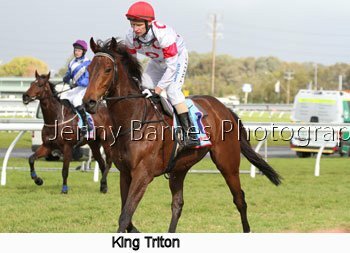 King Triton took his stakesearnings to over $100,000 with the win and has now had 7 starts over the jumps for 3 wins and 4 placings taking his overall record to 33 starts for 5 wins and 9 placings. 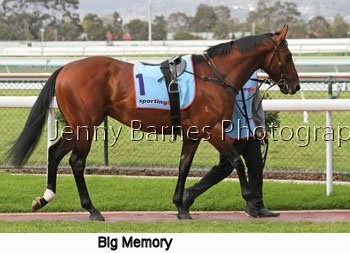 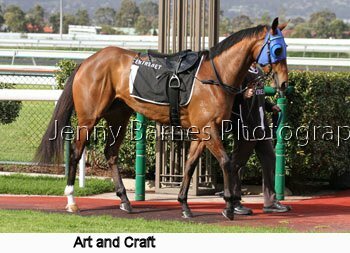 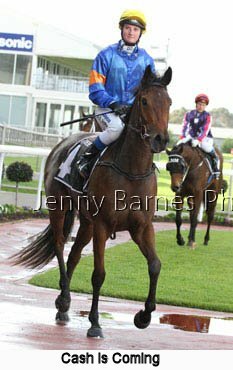 He is by Elvstroem (Caulfield Cup winner) from the Octagonal (AJC Derby, Cox Plate, BMW, etc winner) mare Sea Folly so is well bred for distance assignments and is from the stable of P Hyland and ridden by T Wells. 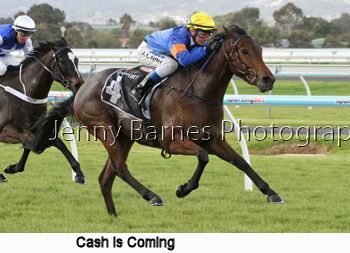 The next race was for the 2yos where previously unraced Ruby Lake show a lot of speed early but in the straight it was the Niello filly Cash is Coming who raced away to win from Charnzel with Goodfun Girl making go ground for third after being very slow to jump. 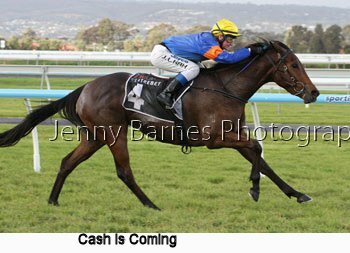 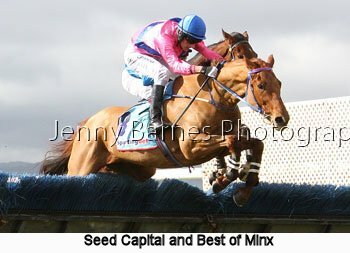 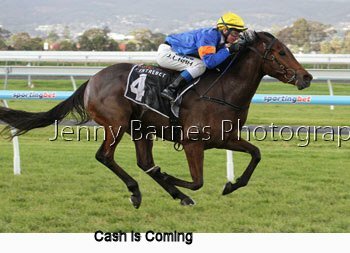 Cash is Coming is from the stable of Ken Sweeney who won one of the features in Melbourne today with sprinter Riziz and was ridden by Jamie Kah. 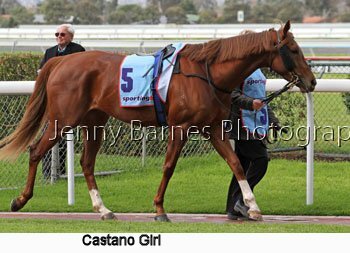 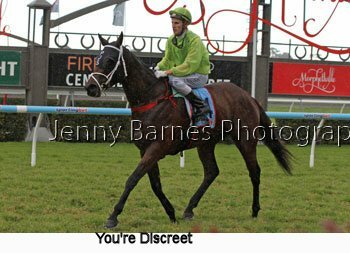 You're Discreet returned to the winners list at her third run from a spell in the next defeating Ferrari Star who went to the lead on the inside in the straight and fought back strongly to the line with Castano Girl in third. 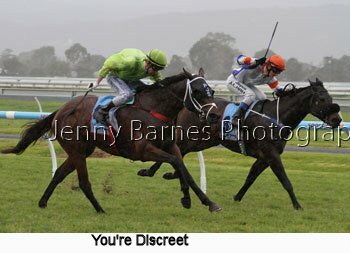 Trained by P Stokes she was ridden by J Matthews and takes her stakesearnings to over $80,000. 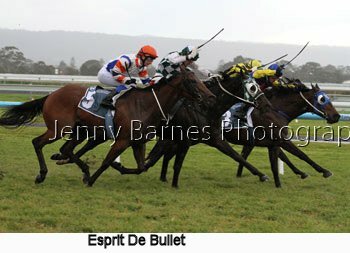 It was a very crowded finish in the fourth race where Mr Good Cat and Counter Sign looked to be fighting it out but in the closing stages first Pocket Rockets made ground out wide then Esprit De Bullet charged between runner to make a line of four. 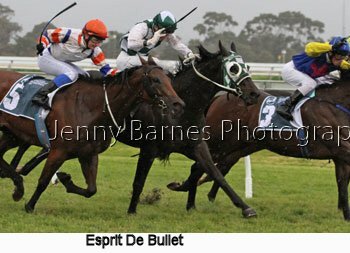 On the line it was Esprit De Bullet who carried 61kg that was too good winning from Mr Good Cat with Pocket Rockets on the outside third and Counter Sign fourth. 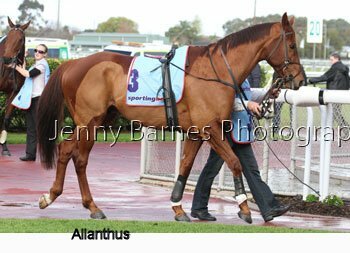 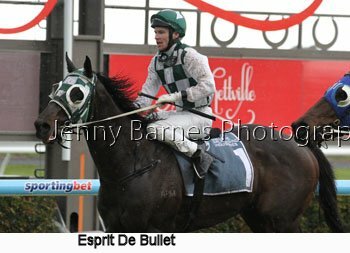 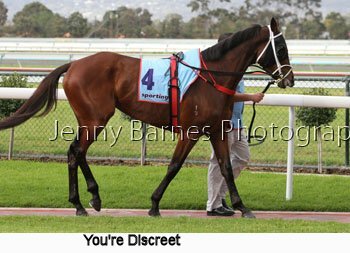 Esprit De Bullet has now won 10 from 25 starts with 3 placings and is trained by John Hyam and was ridden by J Holder. 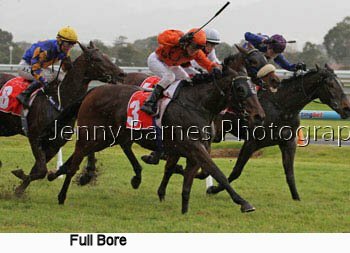 As the rain continued Full Bore was too strong in the next defeating Rich Pride with Umaluka third taking his record to 20 starts for 4 wins and 9 placings and stakes of over $70,000. 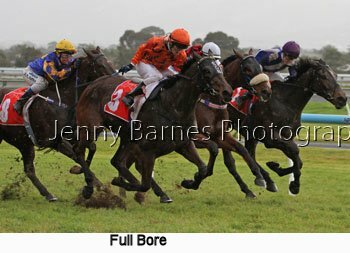 Full Bore is from the stable of S Burford and was ridden by J Toeroek as apprentices took out 3 of the first 4 flat races on the program. 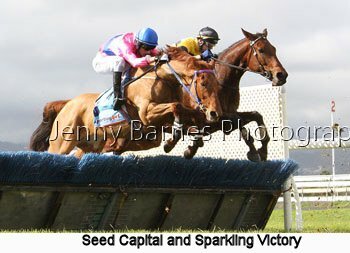 Nearest to Pin resumed from a spell to take out the next from Caitlin's Spirit with Charity Belle third while Halayr Jet stormed away to win the 7th race from Endless Shadow with Champagne Ruby third. 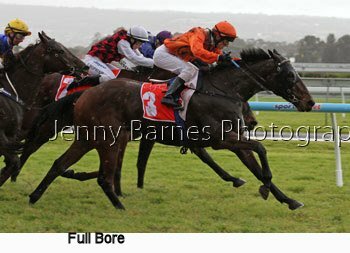 In the last race Victoria made it two winners for the day with Flying Hussler from the stable of Stephen Theodore raced away to win by 2 lengths from Reel Way with Ennooki's Dash putting in another honest effort for third.